Remembering the Horn & Hardart Automat. 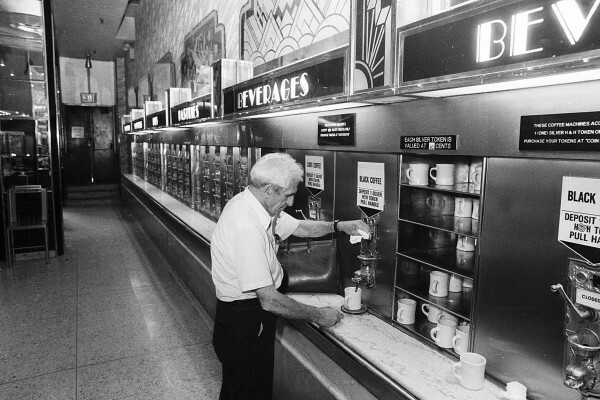 AP file photo, taken June 8th, 1987, of a customer buying a cup of coffee at the last Horn & Hardart Automat, Third Avenue and 42nd Street, Manhattan. (Via Peter Nowak's blog post). I feel an odd nostalgia for the Horn & Hardart Automat. 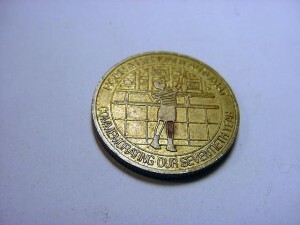 (digitalemur and I were talking about the neighborhood around the Chrysler Building, which reminded me of the Automat.) I say odd because I didn't get to eat there much. In any case it wasn't the food that was memorable. My Dad originally suggested I stop in when I was in Manhattan. By the time I got a chance to eat there its glory days were long over. By then the food wasn't particularly good, and despite its prime location--now a CVS pharmacy--it wasn't very busy the few times I got to eat there before they closed. It was cheap, though, which meant that poor people often hung out there as there weren't staff to chase them away. I was fond of the whole nostalgic, Art Deco feel of the place. The whole coin-operated concept was cool, in a retro-modern way, even if the doors occasionally stuck. I sometimes had to jiggle them to get them open, and I worried I'd lose my tokens if I couldn't. 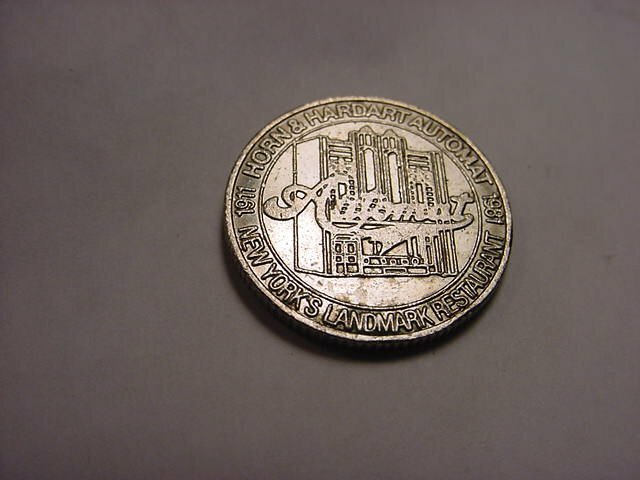 I must have realized at the time that the automat was dying because I bought a couple of tokens, one brass and one silver-colored, just to keep as souvenirs. I missed last winter's New York Public Library exhibit on the Automat, but that's really okay. It's not like they were actually selling food out of the machines. It wouldn't have been the same just to look at the machines and maybe take a recipe or two. Competition from fast food forced cost-cutting in response. Ultimately that killed the Automat. Horn & Hardart closed the central commissary on the West Side which made freshly-made food every day when their remaining New York locations could no longer support it. The food quality never recovered. The Automat was yet another small part of the New York of the '80s that helped to form my concept of a real city. So I miss it, the way I miss a lot of long departed New York. FEBO in Amsterdam still has similar machines, but how many frikandellen and krokets can you really eat? FEBO's machines vend fried snacks for the crowd at closing time. Horn & Hardart had real food. Besides, the last time I went to a FEBO their change machine ate one of my €1 coins and the guy behind the counter was annoyingly unsympathetic.